Throughout the Halo series, Bungie have inserted numerous references to their older Marathon series. Most of these references are appearances of the Marathon logo, which, in the Halo universe, is the Forerunner symbol for "Reclaimer". There are MJOLNIR Mark IV cyborgs in Marathon, there is the MJOLNIR Powered Assault Armor in the Halo series. The Master Chief's Spartan tag is 117. In Marathon Infinity there was a hidden multiplayer map called Hats Off to 819 (named after fan Hamish Sinclair, H=8, S=19) 819 divided by 7 is 117. The Marathon AI Durandal, is named after a mythical sword. Curtana, sometimes known as "Cortana", is a sword which bears the inscription: My name is Cortana, of the same steel and temper as Joyeuse and Durandal. The Plasma Pistol is much like the Fusion Pistol from the Marathon series, which also shares a vibrating overcharge shot. Grunts are similar in design to the generic Pfhor fighters, both being gray-skinned with gangly limbs, with unprotected heads but wearing masks over their mouths (though this is a loose comparison). There is a UNSC ship classified as Marathon-class Cruiser. The campaign begins with John-117 awakening from cryo sleep after a massive battle much like it did in the beginning Marathon 2: Durandal, where the Protagonist woke up after cryo sleep from a massive battle. Carol Rawley, call sign "Foehammer" is named after a level in Marathon: Infinity called "Foe Hammer". Marathon 2: Durandal has a level named "If I Had a Rocket Launcher, I'd Make Somebody Pay," Halo: Combat Evolved has a chapter called "If I Had a Super Weapon..." in the campaign level Assault on the Control Room. On the back part of the Halo rocket launcher it says "SPNKR" which is a reference to the Rocket launcher of Marathon, the "SPNKR X-18 SSM Launcher". The boots and chest plates worn by the Marines were inspired by the ones worn by the Marathon's protagonist . The Covenant light markers seen in the campaign levels The Truth and Reconciliation and Two Betrayals bear a resemblance to Pfhor staves. The Bumblebee pilot who appears in the ending cutscene of the level The Pillar of Autumn and the beginning cutscene of the level Halo wears a helmet similar to that of Marathon's protagonist. Sometimes Grunts or UNSC Marines will shout "They're everywhere! ", similar to the BOBs of Marathon. After killing a Flood combat form, PFC Chips Dubbo on the campaign level 343 Guilty Spark may say "Oh God, I recognized that one. That was Bob!" in reference to Marathon's Born on Boards (BOBs). In the game's tags, Master Chief is referenced as "Cyborg". Alex Seropian once stated in the April 2002 issue of Xbox Nation magazine that the main character of Marathon was the first incarnation of Master Chief. He also said Cortana was linked to the storyline of the AIs from Marathon, though she did not appear herself in the franchise. Matt Soell discussed the subject with Seropian, who later clarified that he did not know the truth. The Marathon-shaped Control Room as seen in Assault on the Control Room/Two Betrayals. The Pillar of Autumn with the Marathon logo seen in the gray circle. The logo of the game has the Marathon logo between the "a" and the "l" of the word Halo. When selecting a difficulty in campaign mode the Marathon logo is visible on the shield. If one brightens the gamma significantly on Halo PC, one can see what looks like the Marathon symbol etched in the background of the first loading screen. The Marathon logo can be seen on both sides of the UNSC Pillar of Autumn. Captain Jacob Keyes has the ship's emblem of the Pillar of Autumn on his uniform, which is the Marathon logo. Captain Keyes' pipe has the Marathon logo on the very tip end of it. The Marathon logo can be seen on the Warthog's dashboard panel. The main chamber of Alpha Halo's Control Room is, when viewed from the top, is shaped like the Marathon logo. 343 Guilty Spark has the Marathon symbol around his eye and on his eye in the first and third game. The center of the island that houses the Cartographer is shaped like the Marathon logo. The Marathon logo is on the front of the Spirit's cockpit. The Marathon logo is visible on the orange part of the Plasma Grenade. In the opening cinematic of the level Cairo Station, Fleet Admiral Terrence Hood mentions the "United Earth Space Corps," Marathon features the Unified Earth Space Council, and both of them share the UESC acronym. The Elite rebellion against the Covenant parallels similar events in the Marathon series. In Marathon, Durandal convinced a group of S'pht to rise up against the Pfhor who enslaved them; and after Durandal's disappearance in Marathon 2, the rebel S'pht found themselves stranded together with a group of humans on a hostile world (similar to the Elites' predicament on Delta Halo). The player's main goal in Halo 2 is to stop the Covenant from inadvertently destroying all life in the galaxy with the Halo installations; in Marathon Infinity, it was to prevent the Pfhor from inadvertently releasing a galaxy-destroying chaos being. There is a chapter in campaign level The Great Journey named "Delusions and Grandeur". Marathon Infinity has a network level named "Delusions of Grandeur". The soundtrack Mausoleum Suite was based off of the Marathon 2: Durandal theme song. Sometimes Marines say "Thank God it's you! ", which is what the Simulacrum BOBs say in Marathon. Some Marines can be heard saying "Eat it, boy! ", possibly referring to the Marathon 2 level named "Eat it, Vid Boy!" The multiplayer map Foundation is based on the Marathon "Thunderdome" level. The multiplayer map Gemini is based on the Marathon level Duality. This is supported by the map's description, mentioning the "ancient duality of the Covenant..."
Once again, the difficulty shields have the Marathon symbol. The Marathon Logo can be applied as a 'decal' to the multiplayer emblems or flag. The Marathon logo can be seen on various doors located in campaign levels and multiplayer maps that take place on Delta Halo. 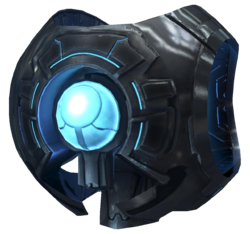 The Forerunner Enforcers' shields make up a Marathon symbol. A Marathon symbol can be seen on the M90 Shotgun's silver casing. The Oddball skull has the Marathon logo in its eye socket. If one gets outside the multiplayer map Burial Mounds, the rubble by the "ribs" has a large piece of debris engraved with the Marathon logo. On the multiplayer map Midship, the Marathon symbol can be seen on Africa (best viewed with scope). On multiplayer map Headlong, in the building which houses mostly human weapons, if one looks at the second floor from above it makes out the Marathon Logo. When viewed from above, the circular courtyard and the small ditch which the water runs along makes up a Marathon logo on the multiplayer map Ivory Tower. When the Halo 2 saved games are viewed in Windows Explorer, they have the Marathon Symbol over the basic file icon. The Campaign begins with John-117 awakening from a massive battle in an enemy space station, in the presence of his allies, near a water treatment plant. This mirrors the beginning Marathon 2: Durandal where the Protagonist awakens from a massive battle on an enemy planet to continue fighting with his allies in the Waterloo Treatment Plant. The Halo 3's first level shares its name with the first level of Marathon. The way the Brute holds Gunnery Sergeant Reynolds captive on Sierra 117 is possibly a reference to the L'howon chapter screen. The personnel in Crow's Nest wear uniforms like those of the BOB's from Marathon. On the last cutscene of the level Floodgate, when the Arbiter is bringing human weapons, a Flamethrower and a Rocket Launcher, are held in the same position as the Cyborg's picture from Marathon Infinity. A fictional company, Traxus Heavy Industries is introduced. Traxus IV was the name of a famous rampant AI in Marathon's universe. 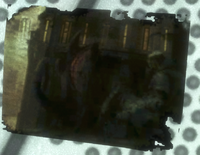 Additionally, in the level The Storm, Traxus IV can be seen etched on the glass panels in the warehouses. The Brute Mauler was probably based on the shotgun from Marathon, which was also dual-wieldable. Some Marines sometimes say "Thank God you're here! ", which is a reference to Simulacrums in Marathon who says "Thank God it's you!" in presence of the player. Grunts scream "He's/they're everywhere!" referencing the BOB's line in Marathon. Flood Combat Forms occasionally say "Melancholia, Anger..." as a reference to the three stages of Rampancy, a reference to the error with AI in Marathon. The design of the golden hologram on Epitaph was inspired by the S'pht Compilers from Marathon 2: Durandal. The level editor in Marathon: Infinity is called Forge. Halo 3 shares that name of its map editor. There is an achievement for accessing all the Terminals in the campaign, called "Marathon Man". On July the Fourth, the phrase "B-B-Q at BOB's Place!" which can be seen on the Forerunner wall of Valhalla which is a reference to BOB-B-Qing, when the player kills many of the BOBs in Marathon. Just like the previous two games, the campaign difficulty shields have Marathon symbols on them. Just like in Halo 2, players can use the Marathon Logo as his/her multiplayer emblem. In the settings menu, the picture of the Spartan has the Marathon logo on its shoulder when it is highlighted. On the Spartan Insignia, there is a gold Marathon logo. The Marathon logo appears on the sides of all of the Covenant CCS-class Battlecruiser. There is a distorted Marathon symbol on the table of the Shadow of Intent's bridge. The elevators on The Covenant and The Ark have the Marathon symbol on their control panels. Just like in Halo: Combat Evolved, the Control Room of Installation 08 resembles the Marathon symbol. The weapons are often decaled with Marathon logos. The BR55HB SR Battle Rifle has the Marathon logo on its optical sight. The M6G has the Marathon logo on the grip near the back. The Brute Mauler has the Marathon Symbol on its hilt over where the character holds the weapon. One may need to look down in light to see it properly. Forerunner monitors, including the one located on the ceiling of the multiplayer map Cold Storage, have the Marathon logo on their eyes. The Security Helmet in multiplayer resembles the helmet that the main character of Marathon (who works in security) wears. It also has a Marathon symbol on its forehead. The Recon helmet in multiplayer has Marathon symbols on its sides. The yellow hologram on the multiplayer map Epitaph has a Marathon logo on the circular part. On the multiplayer map Snowbound, the Marathon symbol can be seen imprinted on the planet in the sky. The center of the multiplayer map Guardian is, when viewed from above, similar to the Marathon logo. On the multiplayer map Heretic, Marathon symbols reflect off the surfaces of the interior walls. They are also visible on the side-of-the-room walls' shield. The body bag, a ', has the Marathon logo imprinted on it. The Marathon box-art found in around Halo 3: ODST. The avatar used to represent the AI Tycho from Marathon was added to the list of emblems under the same name as the AI. It is also the second emblem to be added to Halo with affiliation to Marathon. Around the game, garbage of the original Marathon box-art can be clearly seen throughout the game. The difficulty shields, yet again, have the Marathon logo imprinted on them. Halo 3: ODST is the last Halo game by Bungie to have the Marathon logo-imprinted difficulty shields. At the very start of Uplift Reserve, the Marathon logo can be found. In the HUD Menu the Marathon logo is behind the Triad logo. Before entering the elevator in the campaign level Coastal Highway, if one jumps above the circular structure near the door, it makes the shape of the Marathon symbol. The Marathon logo is visible on Veronica Dare, Avery Junior Johnson and the Rookie's backpack. A symbol is seen on a rock when the whole waterfall is visible, as well as inside the waterfall at the base. The symbol found on the Wraith's gunner seat. Bungie avoided the use of the Marathon symbol in Halo: Reach, presumably due to property rights issues with Microsoft. The symbol has been removed from the emblem gallery, the difficulty icon shields, the hull of the Pillar of Autumn and replaced with the Seventh Column on Captain Keyes' ID patch. The symbol in the eye of the Forge Monitor has also been changed. At the end of the level Long Night of Solace, ATC 1 shouts, "They're everywhere!" This is an iconic line of the BOBs in the original Marathon. On rare occasions, enemy NPCs known as "BOBs" may be encountered by the player. This name is a reference to the BOBs of the Marathon series, humans who were born onboard the titular colony ship. A symbol that resembles the Marathon logo can be found on the seat of the Wraith's Plasma cannon turret. While not appearing fully in the actual game itself, the whole symbol can still be seen in early concept art owned by Microsoft. In a scene depicting UNSC forces on the move, the golden decal is located on the right-most Spartan, on his/her upper left chest plate. Some Sangheili believe that "Demons" are actually corpses reanimated through artificial means to continue fighting as supersoldiers. This is reminiscent of the battleroids from the Marathon trilogy. Likewise, battleroids are brought back from the dead to serve as physically and technologically augmented supersoldiers. The player character is a Mjolnir Mark IV battleroid. The Reclaimer symbol has been visually retconned, though it still clearly resembles the Marathon logo. In the opening cinematic of the Spartan Ops episode Invasion, a Marine yells, "They're everywhere! "; this is a notorious line spoken by the BoBs in the original Marathon. However, Marathon is owned by Bungie, not 343 Industries, so it is probably coincidental. The original Marathon symbol is seen on holographic panels in the final Spartan Ops chapter of Key. The start menu of Marathon 2. The logo at the end of Keyes's pipe. The emblem of the Pillar of Autumn bears the logo. Installation 04's Control Room is the shape of the logo. Marathon logo on a sniper rifle, from Enemy Weapon video. Marathon Logo on the side of the CCS-Class Battlecruiser on Tsavo Highway and Crow's Nest. The marathon symbol in The Babysitter.